Disasters like tornadoes, earthquakes or fires can take visible tolls on communities, but the effects on survivors can reverberate long after the initial danger has subsided. Images of devastation have dominated media coverage this spring, from tornadoes and massive flooding in the American south to deluges on the Canadian Prairies and Quebec to harrowing forest fires in Slave Lake, Alta. These disasters have taken a visible toll on communities — damaging properties, ruining homes and endangering if not destroying people's livelihoods. Events like these don't always result in casualties, but the effects on survivors can reverberate long after the initial danger has subsided. "We have to recognize that the shock and pain of this loss is so frightening — nobody is prepared for this kind of devastation," says Debra Armstrong, a volunteer with the Red Cross's Disaster Management and Worker Care program in Calgary. "The people right now in Slave Lake, or those going through these disasters in Manitoba, there's a need for information right now. That's their No. 1 stressor in the first few days," says Armstrong. "Until they get that information, they're unable to make plans, and they're holding it together for family and friends." 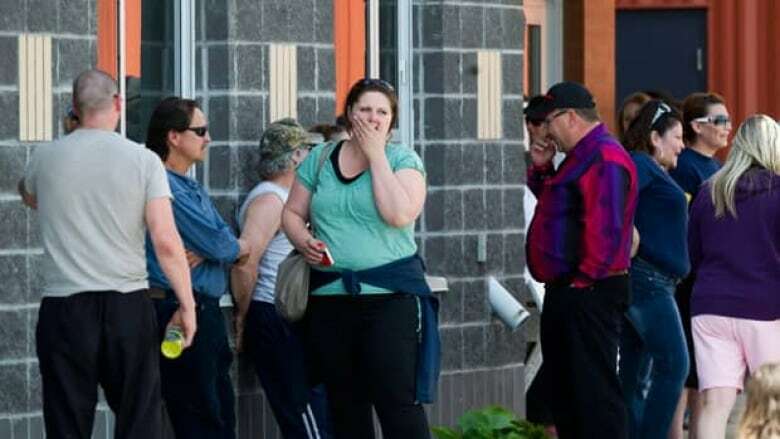 Disasters "represent significant risk factors to the mental health of trauma survivors," says Dr. Katy Kamkar, a clinical psychologist with the psychological trauma program at the Centre for Addiction and Mental Health (CAMH) in Toronto. Having survived a storm intact, survivors begin to turn their attention to what they've lost: cars, houses, irreplaceable possessions. This is where the mental anguish really begins. "The psychological distress associated with these disasters is typically exacerbated by the stressors that occur in the aftermath of the trauma," says Kamkar. According to Dr. Kamkar, trauma survivors go through a psychological process similar to the Five Stages of Grief associated with a terminal illness or the death of a loved one. 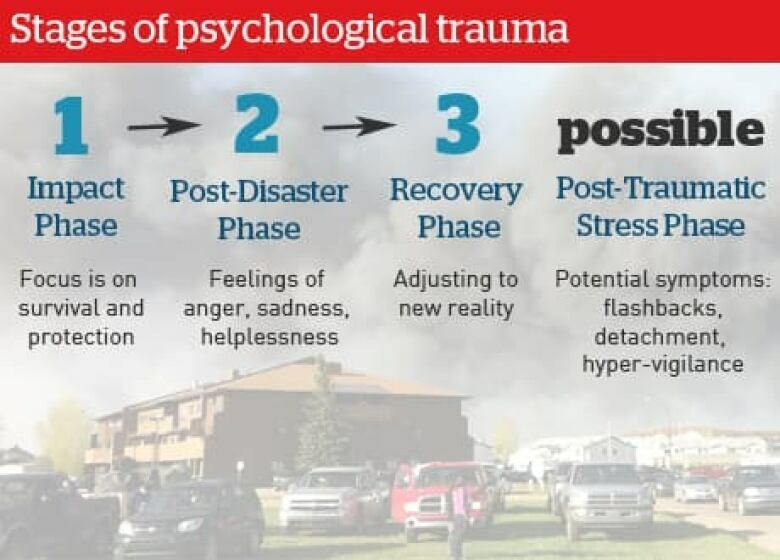 The first phase is the Impact Phase, in which people experience a flurry of emotions but focus mainly on protecting themselves and the lives of those closest to them. It's in the next stage, the Post-Disaster Phase, that feelings of sadness, anger, helplessness and/or hopelessness become more pronounced, as people begin to take stock of the destruction. We see manifestations of this in Slave Lake, where the fires have largely been brought to heel and evacuated residents await word on whether they still have houses to return to. The comes the Recovery Phase, in which people begin to adjust to their altered surroundings, a process largely determined by the severity of the traumatic event and the personal losses they incurred. Depending on the circumstances, a person may enter a fourth phase: the Post-Traumatic Stress Phase. This is made up of a cluster of symptoms, from intrusive memories or flashbacks to feelings of emotional detachment to a hyper-vigilance that can affect work and sleep patterns. The person continues to feel fearful, helpless or horrified. Post-traumatic stress disorder (PTSD) isn't an inevitable outcome, but it is a common one. "We know it's very normal to have those feelings after a traumatic event," says Kamkar. "When the symptoms become prolonged and distressing and they start interfering with a person's functioning, and they're increasing over time rather than decreasing, this is when it is very important to seek professional help." Knowing that there's a recurring risk of disaster, as is the case with flooding in the Prairies, can reduce people's psychological distress somewhat because they are able to take steps to mitigate the extent of the damage. "The more unpredictable and uncontrollable a traumatic event is perceived, the more an incident can trigger symptoms of PTSD," says Kamkar. "But if there is some preparation, it will help [people] cope with some of the symptoms." The media can become a complicating factor in a disaster, wading into an affected community with great gusto and then just as quickly leaving once the event is no longer deemed newsworthy. Visiting journalists may be well-intentioned but they may not be capturing the full picture. "[Trauma survivors] often hold it together for the media. They put on that brave face," Armstrong says. "But the [news] stories may not be an accurate reflection of what's going on in the community's heart." As someone who was worked as a first responder in devastated communities, Armstrong has seen the range of emotions up close. She was on hand during a massive condominium fire in Erlton, Alta., in 2002, as well as the 2003 forest fires near Kelowna, B.C., and the flooding in Saskatchewan last spring. "Every time I hear about the [Slave Lake] fires, for me, that has a particular meaning," says Armstrong, referring to her days in Kelowna in '03. "Once the fires had stopped and there was just the smouldering ashes, I remember the smells. I remember helping families sift through the rubble looking for pieces of meaning. I can't say I feel their pain, but I've been there to hear their pain."